Pray for all the resources and creativity needed to fulfill the intentions of God in the state of Alabama. State Information: Known as the Heart of Dixie, Alabama became the 22nd state in 1819. 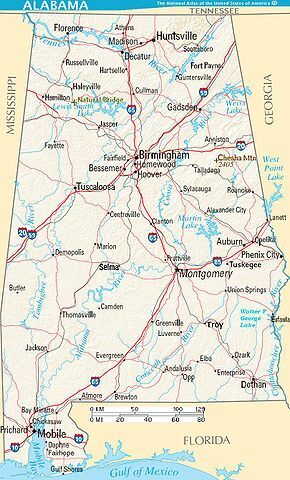 The name Alabama is derived from an Indian word meaning “thicket clearers.” Alabama has been at the center of many American battles–between white settlers and Native Americans, and between the North and South in the Civil War. The state also is home to the first of three Space Camps in the United States. These camps let kids experience what it would be like to be in outer space.